I pray that, today especially, you remember the sacrifice Christ made for us on the cross. Several years ago, I wrote a poem for the FaithWriters' Writing Challenge that folks have often told me is especially fitting for today. Thanks to my awesome husband's leading, it is going to be read (by him, by the way!) at our church's Good Friday service. It's one of those pieces that I know was inspired by God. If you'd like to see, click here (then come back for Finds for Fridays LOL). 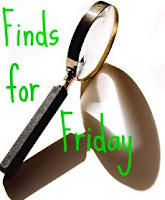 Finds for Fridays is my way of sharing some of the wonderful blogs posts I read each week. I am currently following over 100 blogs and at least scan them as much as I can. Each week, I'll note and "set aside" some posts that especially speak to me for whatever reason. And each Friday that I am able, I'll share them with you. I hope you'll stop by and read the posts, and maybe even follow the blogs if you aren't already. A win-win, right? Hope you'll stop by these blogs and check out the post - and maybe even follow the blogs. You won't be disappointed. That poem is powerful dear Joanne and absolutely beautiful. Lovely poem Joanne. And thanks for passing on the links. Have a blessed Easter weekend.